Pumpkin seeds roasted make a great topping for salads, grains or vegetables adding extra protein. They are even yummy to eat as a snack. This is a quick way to add some extra flavor to your grain or steamed vegetables or just for a snack. Also, pumpkin seeds are the only seeds that are alkaline forming. Nutritious Nut Loaf – Hearty and great tasting! Great for a special occasion especially for a vegan feast. 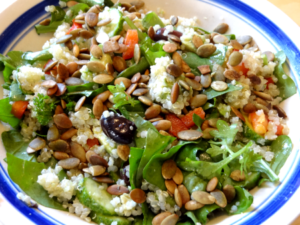 Quinoa Arugula Salad – This is a yummy and nourishing quinoa arugula salad for any season. It is full of good protein from the quinoa and the pumpkin seeds, roasted. Seed Topping for Rice or Vegetables – This is a quick way to add some extra flavor to your grain or steamed vegetables or just for a snack.